In 1946, while in the Navy, working at the site of the Bikini Bomb Tests in the Bikini Atol, Lieutenant Paul M. Sutton composed these two love songs on the piano in the wardroom of the U.S.S. Wharton (AP-7). 1. August 14, 1945. Japan surrenders! World War II is over. 2. Lieut. Paul Sutton is required to remain in the Navy after the war, until June 1946 at minimum. 3. Paul was assigned to the Inspector of Naval Material Office (INM) at 30 Church Street, in New York City (close to what is known as Ground Zero today). 4. Naval officers oftentimes attended the Officer's Club at Delmonico's Hotel at 59th and Park Avenue in NYC. Paul met Doris at the Officer's Club. In his own words: "She was beautiful, intelligent, serious, a good dancer, and a poet too!" 5. Paul was a physicist, with a Bachelor's Degree from Harvard. The GI Bill made it possible for Paul to return to Graduate School at Columbia University, in the Fall of 1946. 6. So how did Paul spend his time from June 1946 until October? At the Atom Bomb Tests at Bikini of course! Working with testing the bomb was good experience for a physicist, and helped him save money to go to Graduate School. Doris was left behind in New York, waiting for his return. 7. So Paul applied for the Physics Post in Navy Operations Crossroads - Bombs 4 & 5. He went to Washington D.C., hand-carrying his application form from one office to another, finding Captain Chas Piggot of Ordinance Evaluation Group who needed an assistant. 8. 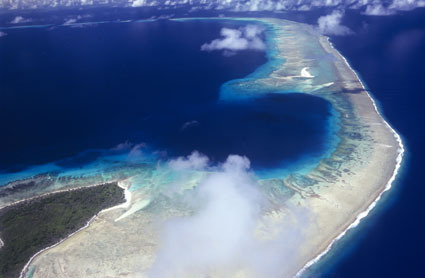 Paul was transferred to Operation Crossroads, Navy Department, Washington D.C. in March, 1946. Doris visited Paul in April, 1946, in Washington. Cherry blossoms are great for poetry! 9. In May, 1946, Paul took the train to San Franciso, California. He was assigned to the U.S.S. Wharton (AP-7), which docked at Pearl Harbor May 5-12th. It was a busy nine days while at Pearl Harbor, for Paul, and on the last day, Paul waited in line for four hours to put a telephone call through to Doris. The U.S.S. Wharton left for Bikini the next day. 10. The U.S.S. Wharton anchored in the center of Bikini Lagoon. Paul and the crew checked all 76 target ships to see that the exposure plan was followed. 11. Bomb No. 4 was tested on July 1st, 1946. It was labelled TEST ABLE. 12. The report on the Test results were prepared. The exposure plan for the next bomb was then checked. A number of the target ships were moved or changed. 13. The grand piano in the U.S.S. Wharton wardroom looked inviting to Paul! 14. In-between Bomb Tests No. 4 and 5, Paul wrote a Love song and lyrics for Doris. The composition was developed in mid-July, 1946. She was "Just a Dream Away"! 15. Bomb No. 5 was tested on July 25, 1946. It was labelled TEST BAKER. 16. The report on the Test results were prepared. 17. Paul returned to Washington D.C. and resigned from active duty on October 25, 1946. 18. Doris and Paul went to Jones Beach on a Sunday in September. On the way back, they went to the Empire State Building and Paul finally proposed at the top of the Empire State Building, while looking at the distant twinkle. Now A Dream Come True! When Japan bombed Pearl Harbor on December 7, 1941, war brought drama and change. Paul felt fortunate to be allowed to complete his honors degree in Physics at Harvard College, graduating in June of 1943. He was then trained and assigned by the Navy to 3-1/2 years of ordnance duty in the Atlantic Theater, sent to Brazil but stationed on Ascension Island. He was in charge of a top-secret acoustic homing device that effectively destroyed some of the Nazi submarine activity which brought minerals to Germany from Sumatra, around the Cape of Good Hope and up the coast of Africa. As the war drew to a close, Paul was then assigned to a blimp squadron in Elizabeth City, North Carolina, where five days before the Germans surrendered, a blimp destroyed a German submarine using this device. To this day, full details about this weapon are not readily disclosed. After the Japanese surrendered on August 14, 1945, Paul was sent to 30 Church, Street in New York City, to help cancel Navy contracts. New York was a very hospitable place for military men, offering many service and social clubs, theaters and nightclubs. Even the famous Stork Club and 21 Club welcomed servicemen at low cost, providing a glamorous-background for this transition time. The popular Stage-door Canteen and many others are still recalled by many. But it is the Officer's Club at the Hotel Delmonico, at 59th St and Park Avenue, that takes center stage for the Suttons. It was run by two N.Y. Socialites, Mrs. French and Mrs. Hull, who provided a lovely setting and both formal and informal dances, a pleasant spot to meet and mingle. Paul met Doris there in September 1945. They became friends, went to theater, liked dancing. They shared many interests, including poetry. They celebrated New Year's Eve together. In March, 1946, when Paul transferred to Washington D.C. to coordinate bomb test targets for the Bikini bomb tests, he was encouraged when Doris came down to Washington to say goodbye to him under the Cherry Blossoms. It was the end of April. 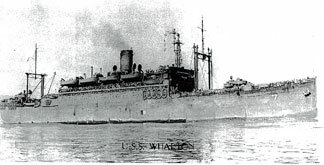 On May 1st, Paul and Captain Piggott with other technical personnel took the train to San Francisco where the USS Wharton was anchored and they boarded the Wharton and sailed to Pearl Harbor. Nine busy days in Hawaii at Pearl Harbor followed outfitting target ships. On the tenth day, a four-hour wait to put a phone call through to Doris went through. It raised Paul's hopes that perhaps she cared about him. In September, 1946, back in Washington D.C., Paul resigned from the active duty Navy. With GI Bill in hand, he went to New York City, registered for graduate school at Columbia University and took on a teaching commitment. He also remained in the active Naval Reserve. 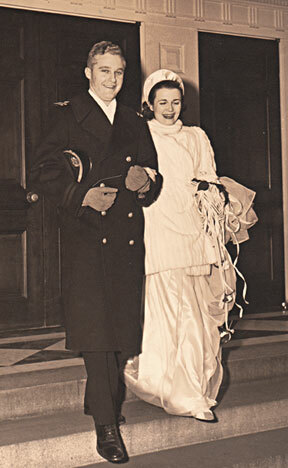 On Thanksgiving Day, November 28,1946, Paul and Doris married and have lived happily ever after, ever since!